NAMES: George JOHNSTON of Ballynameta aka Wood Park; William OLIVER of Lislooney; William SCOTT; and Francis SCOTT of Killlalea, Parish of Tynan; John SCOTT of Armagh City; John HAMILTON; J.A. MANSON. OTHER PLACES: Enagh. Given how early this Deed is - 1718 - it may connect to the William OLIVER of Mullitur. The Deed is between George JOHNSTON of “Ballynameta” also known as Wood Park, situated in the Parish of Tynan, Co. Armagh and William OLIVER of Lislooney (also in the Parish of Tynan). It is likely significant that a century later, a Benjamin OLIVER was a freeholder of Lislooney. Update August 25, 2017. Updated footnote re; Ballynameta thanks to Sean Barden. NOTE: My notes and the image of the signature of William OLIVER come from the actual memorial of this deed. The transcription of the memorial at the Registry of Deeds can be viewed at Image 219. It would appear that William OLIVER was already residing at Lislooney prior to the lease. This lease poses questions for which I have no answers. Why was this lease signed in 1718 but the memorial signed five years later in 1723? Why was this lease for only one acre in Lislooney, but for a term of 99 years? Did it give access to a road, was it a part of the land that had been separated from the main part of the lease by a road, or was it an acre of bog (hence possibly adding onto and cleaning up an omission from an earlier deed)? NOTE: In subsequent deeds relating to OLIVERs with the same forenames and land interests, there is reference to an acre of bog in Cavanapole, a nearby townland. Also referenced in 1853 Apr 16: 1788 Feb 6 to & in possession of Arthur OLIVER & Benjamin OLIVER & lately in the possession of James OLIVER refers to lease 6 Feb 1788 renewed 13 April 1829 & a debt judgement 1822 against Benjamin OLIVER for £400 to John BURNS. The above map is based on one that can be found at townlands.ie. The names of contiguous and nearby townland names shed light on the connections between various members of the OLIVER families and the other leases that they held. 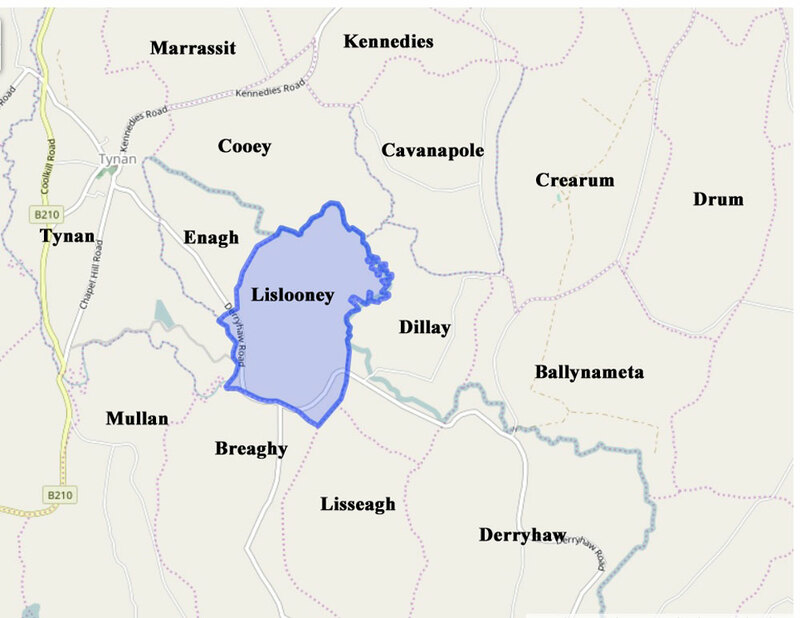 The map above shows the location of the townland of Lislooney is with respect to Killylea (about 3.5 km as the crow flies) as well as to Derryhaw (2-3 km along the Derryhaw road aka the Highway Leading from Tynan to Keady). Significant OLIVER leases were connected to these places. To understand the above map, you have to stand on your head. 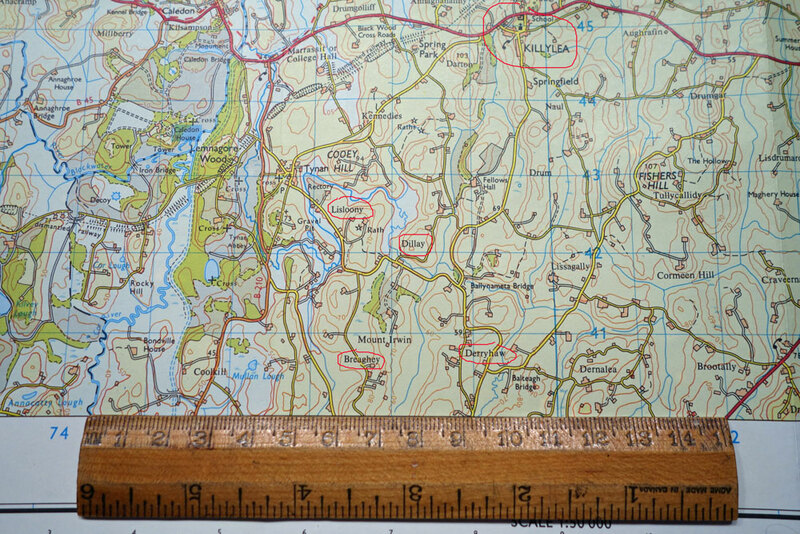 Its orientation has North at the bottom of the page, rather than the more usual orientation of North being at the top of the map. Even so, the road leading from Tynan in the east (on the right) to Keady in the east (on the left) is clear. The road leading from Fellows Hall connects to the road slightly to the east (hence to the left) of where Lislooney is. George JOHNSTON. Given the occurrence of this name in later leases connected with OLIVERs and Laragh, this name is interesting. The contemporary spelling is “Ballynameta” also known as Wood Park, situated in the Parish of Tynan, Co. Armagh. It is just to the east of Lislooney – separated only by the townland of Dillay. William OLIVER. SEE:The OLIVERS of Cavanagarven They can be traced back to about 1800 and are likely related. Also,, the OLIVERs of Killynure are probably related as well. · There are several William OLIVERs in this time frame. Getting more specimen signatures could be helpful in determining whether he was distinct from the William OLIVER (bef 1700- aft 1730) of Ballynahone, Parish of Armagh (who married Elizabeth HARDY), or the William OLIVER (1670-1726) of Mullinture, Parish of Eglish or the William OLIVER (b abt 1641) of Ballydoo, Parish of Eglish. 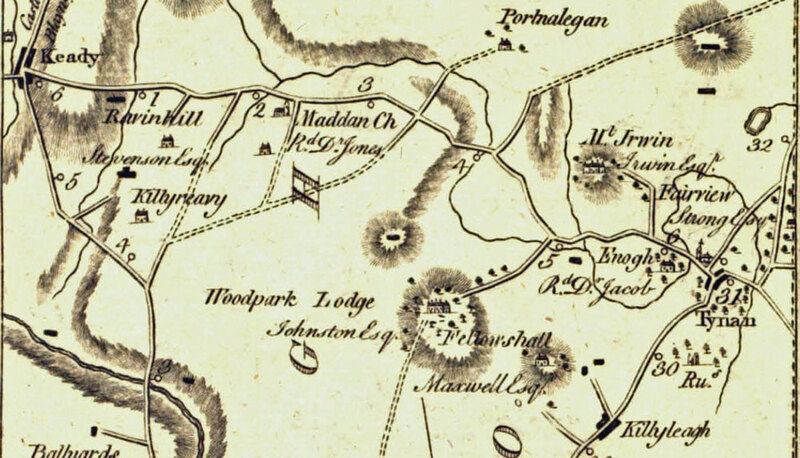 · A deed of 1738 February 6 makes a compelling case for a connection between the OLIVERs of Ballynahone and the OLIVERs if Lislooney. It is for 46a 2r - the same acreage mentioned in a deed of 1824 April 6 - and mentions several family members. · Interestingly, a RootsWeb tree of the SPEER family has their William OLIVER born in Latakeel, near Cookstown, Co. Tyrone, Ulster. The source they used was: Irish Pedigree. John O’Hart. Not all the facts in this tree ring true. For example, Elizabeth VANCE née OLIVER is alleged to have been born in 1700 and to have died in 1800. Without documentation to validate them, deaths at age 100 are usually suspect in my books – but she would otherwise make a neat fit to the Elizabeth OLIVER b. 1728. See also: OLIVERs of Tattykeel. · page 11 of Irish Ancestry of Henry (William) OLIVER mentions a William OLIVER born about 1670 possibly at SherranmcAghully (AKA Farmacaffley), Parish of Eglish, Co. Armagh or Tattykeel, Parish of Kildress, Co. Tyrone and hypothesises that he was a son of Andrew OLIVER of Tattykeel and therefore the brother of an Eliza OLIVER who married John VANCE (page 10). This last fact ties in with the suggestion in the SPEER family tree. They may have referenced the same source. Lislooney, Parish of Tynan, Co. Armagh. In the early 1800s, a century after this Deed, a Benjamin OLIVER was registered as a freeholder at Lislooney and other records show the family there after this time. Contemporary spelling: Enagh. This townland is the parish of Tynan, Co. Armagh, on the western border of Lislooney. There is another Enagh in the Parish of Lisnadill – just to confound us, the OLIVERs had leases in both! William SCOTT. It is of interest that LDS has a record of a William SCOTT who married an Isabella OLIVER in the Presbyterian Church of Drumbo, County Down in 1720. Worth Checking out! A William SCOTT was also one of the Derry fighters in 1689 from Co. Monaghan. John HAMILTON. Given the later Jane HAMILTON - Joseph OLIVER marriage, this is interesting.